This week we discussed Bill Buford's Hea t : an amateur's adventures as kitchen slave, line cook, pasta maker, and apprentice to a Dante-quoting butcher in Tuscany. Some folks thought it was just hilarious and delicious and gobbled it up, but others found the writing style to be disjointed and unorganized and couldn't finish it. 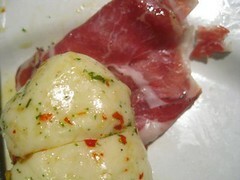 Overall the group found it entertaining and appetizing. There was some question as to what happened to Mario's restaurants in the book, and to judge by his website they are all doing just fine! 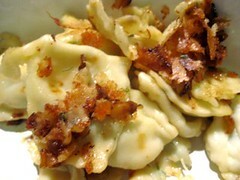 Karen cooked ricotta cheese ravioli with carmaliz ed onions. 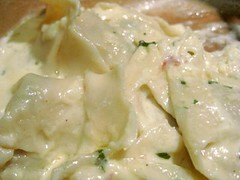 Ka tie made cappellacci filled with sweet potatoes and parsley served with butter and cream sauce from The Classic Italian Cookbook by Marcella Hazan. 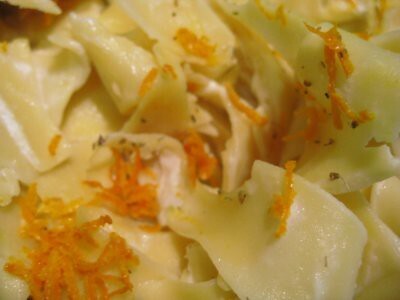 Katie S. made homemade pasta with fennel pollen, orange zest and goat cheese. 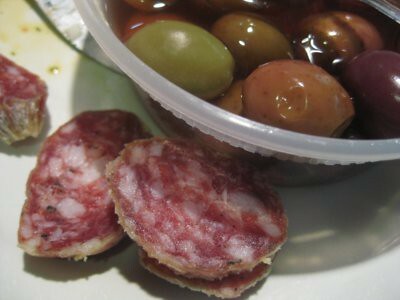 Dawn brought boc concini, coppa, cappielio, olives and fresh Italian bread from Borracchini's Bakery in Seattle. Heather brought bread and delicious Irish butter and olive and balsamic vinegar. 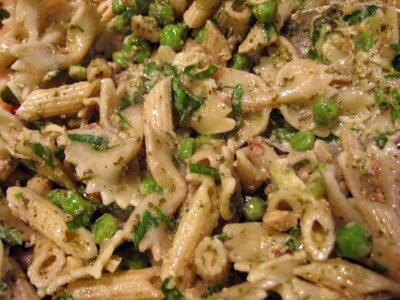 Julie brought P asta Peas & Pesto. 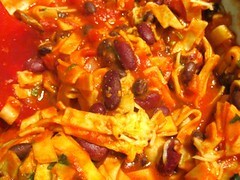 Sheri brought Pasta e Fagioli - Mario's recipe from the Food Network. 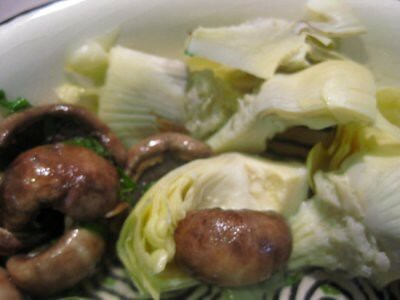 Tanya brought marinaded vegetables, inclu ding mushrooms, white asparagus and artichoke hearts. For show and tell, Julie shared her new herb scissors. 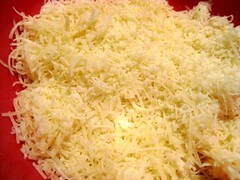 There was also discussion about clafo uti, a French cherry dessert that someone will have to make for next time! Overall it was a very enjoyable discussion and meal! Next month we are traveling to a different region of Italy for A Thousand Days in Venice. We are short on copies, so please return yours to the library as soon as you finish!